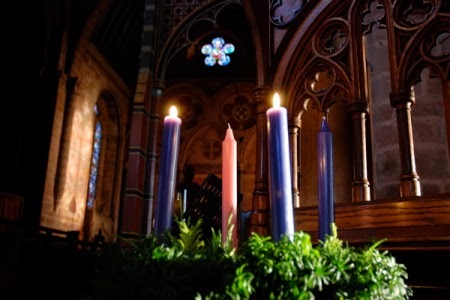 Light the second candle on your family Advent wreath. On December 7, we remember the Americans who perished in 1941 as a result of the Japanese attack on Pearl Harbor that hastened the United States' entry into World War II. 2,403 Americans lost their lives on "a date which will live in infamy," as President Franklin D. Roosevelt declared in an address to a joint session of Congress the following day. Take time today to remember the victims of all wars, our veterans and those currently serving in the military. Here are some prayer suggestions. . . from the Archdiocese of the Military Services. December 7 is also the Feast day of the "Martyrs of Africa," approximately 200, many unnamed or for whom there is little if any biographical information. According to Catholic Saints-online, "this is the collective name of those who died for their faith in Africa Latina, the northwestern region of the continent." Today, the Catholic faith is spreading rapidly on the African continent, but the Church there is poor and has many needs. Find out how you can help by supporting the Solidarity Fund for the Church in Africa. On this weekend, many parishes hold the national collection for the Retirement Fund for Religious. For senior Catholic sisters, brothers, and religious order priests, that they may enjoy dignified care in their elder years as they continue to devote their lives to prayer and service. Let us pray to the Lord. For all the elderly in our nation, that they may be treated with respect and compassion and that we as a society may more fully embrace their gifts of wisdom and grace. Let us pray to the Lord. On this Solemnity of the Immaculate Conception, attend Mass and recite the Hail Mary or another favorite Marian prayer before your evening meal. Today is the patronal feast day of the United States of America, which means Mary Immaculate is our patron saint. Read about Mary and why she has a unique position among all of the saints. Watch the video Our Lady & Me of and reflect on the universality of our faith and devotion to Mary. God chose to reveal his power to Gideon, who came from a poor family, by letting his army of 300 men defeat more than 100,000 at Midian. Gideon followed the Lord's instruction to have his men approach the town with their torches hidden under pitchers. The people of Midian were so startled when the pitchers were broken and the soldiers made themselves known, that many began fighting among themselves. The pitcher ornament reminds us of how Gideon became an unlikely leader and judge, helping his people cast aside false gods and obey God's true laws. Read Judges 7 for more details. Today, we remember St. Juan Diego. . . to whom the Blessed Virgin Mary appeared on a hill in Tepeyac, Mexico in the 16th century. Juan Diego was canonized by St. John Paul II during his 2002 apostolic visit to Mexico. Pray today to St. Juan Diego for the protection of migrants and refugees. Samuel, son of Elkanah, was repeatedly called by God. When at last he recognized the Lord's call, he adhered to it without fail, and proclaimed the coming of Christ the King who would have dominion over all earthly kings. The symbol of the Jesse Tree to illustrate Samuel's story is a crown. Read about Samuel in 1 Samuel 3:1‐21, 7:1‐8:22, 9:15‐10:9. The United Nations has proclaimed December 10 International Human Rights Day. Learn about Church teaching on the life and dignity of the human person. Pray in particular today for the life and dignity of the peoples of Africa and read about the Church in Africa, which has almost tripled in size in the past 30 years despite challenges of debt, epidemics, severe poverty, and political unrest. Keep up-to-date on issues impacting the life and dignity of the human person by signing up for a free subscription to the People of Life newsletter. Optional memorial of St. Damasus I, Pope. Watch a video about the impact of poverty in the U.S. on families and learn how you can help. Start by participating in a Christmas Giving Tree program in your parish or community. USCCB Action Alerts: During Advent, as you joyfully await the coming of Christ, take action to proclaim God's kingdom of justice and peace for a world in need. Visit the USCCB Take Action page to join with people of faith to advocate for the protection of human life and dignity in our world. Learn about the practice of Lectio divina or "Divine Reading" and consider making it part of your family's Advent spiritual tradition. On this feast of Our Lady of Guadalupe, read about her appearance to St. Juan Diego. . . and pray to her as patroness of the Americas for the protection of our religious liberty. Deepen your understanding of Mary's unique position among the saints. If you have a statute of the Virgin Mary in your home, decorate it with roses or other flowers today in the Mexican tradition. Pray the words Blessed John Paul II gave us when he canonized St. Juan Diego. Today's Feast of St. Lucy. . . , is marked by pageants and festivals inScandinavia. . . & Italy. . . . Research an Advent or Christmas custom of your own family's ethnic heritage and try it this year. St. Lucy's name is taken from the root for the word "light," a very important theme in Catholic social teaching. Take some time to review the bishops' guiding document for parish social ministry in the United States, Communities of Salt and Light and reflect on whether your parish is a community "of faith, of action, and of hope." On Copacabana Beach at World Youth Day this summer, the Holy Father told the young people gathered. . . : "You too, dear young people, can be joyful witnesses of his love, courageous witnesses of his Gospel, carrying to this world a ray of his light. Let yourselves be loved by Christ, he is a friend that will not disappoint." Encourage the youth and young adults in your families and parish communities to carry that ray of light into their world – and to share the Gospel with their peers (especially those less active in the practice of their faith).